I had my first perfect tangerine of the season the other day, and that kick started my annual love affair with citrus. Citrus fruit is endlessly inspiring to me as an eater and as a cook. I love those juicy flavors and cheery colors, I love all the new varieties that have come out lately, and I love that it bursts into season in the dead of winter. Who cares that we can’t have ripe tomatoes or masses of backyard basil right now ~ we’ve got bright juicy citrus! This pie starts with an unusual gingersnap walnut crumb crust ~ it’s sweet and spicy at the same time, and so good that I’m always on the lookout for an excuse to make one. It’s just as easy to make as a regular crumb crust, but the flavor is so much better. You can crush any crisp gingersnap cookie you like, but I’m partial to the super thin ones from Sweden. If you can’t find them, most stores carry some type of gingersnap year round. Put the gingersnaps in a food processor and process until they are fine crumbs (This should be about a heaping cup, in case you're using ready made crumbs) Add the walnuts, and sugar and process again until everything is finely ground. Add the butter and process briefly to combine. Put the sugar, cornstarch, salt, and egg yolks in a saucepan with a heavy bottom and whisk to combine and break up the yolks. 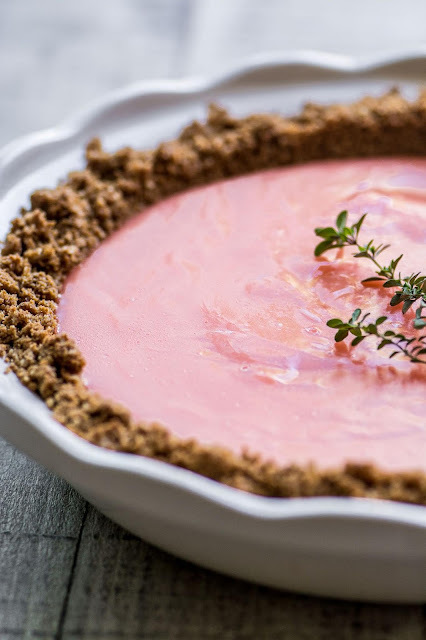 Whisk in the juices and add the tiniest bit of food coloring to enhance the pink tone. Less is more when it comes to the coloring, and the pink will deepen as the curd thickens. Take off the heat and whisk in the butter pieces, the mixture will be thick and glossy. Strain the curd though a mesh strainer if you like, the step is optional, but will remove any little bits of curdled egg. Fill the pie shell immediately, the curd will start to set fairly quickly. 0 Response to "GRAPEFRUIT GINGERSNAP PIE "